Look at that profile – it screams last sprint opportunity until Paris doesn’t it? And that’s just what will be on the sprint teams’ minds as they swoop out of the Massif Central and into the Rhone Valley for the finish at Valence. But it’s not a nailed-on certainty. This is not the first week and we’re sure to see many riders trying to make this a perfect breakaway day. The riders tackle the first three categorised climbs right from the roll-out and then get into their best aero tuck for the 30km fast descent towards the intermediate sprint. 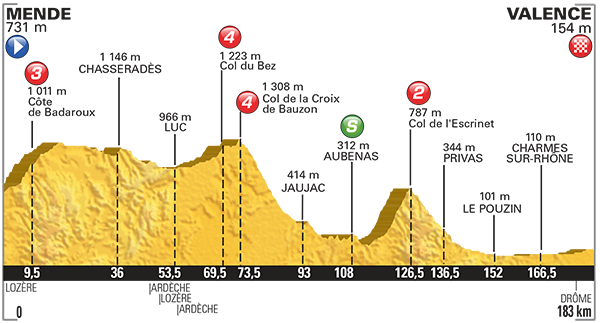 The fly in the sprint finish scenario is the 7.9km Cat 2 Col de l’Escrinet: at a 5.8% average it may well catch the sprinters out, although a certain Mr Cavendish survived it in 2009 to take his fifth stage win. This year it’s a lot further from the finish (75km or so) and this should give ample time to catch back on and reel the break in. The Rhone Valley is prone to windy conditions, and a little echelon action would certainly add some spice on the exposed flat run in towards Valence. It’s a technical finish with a tight left-hand bend at 3km and a sweep to the right at a roundabout in the final 500m. Expect a frisky start and very downhearted fast men if they get this one wrong.